Theme Park Music Series: AstroWorld | Random Thoughts - Randocity! 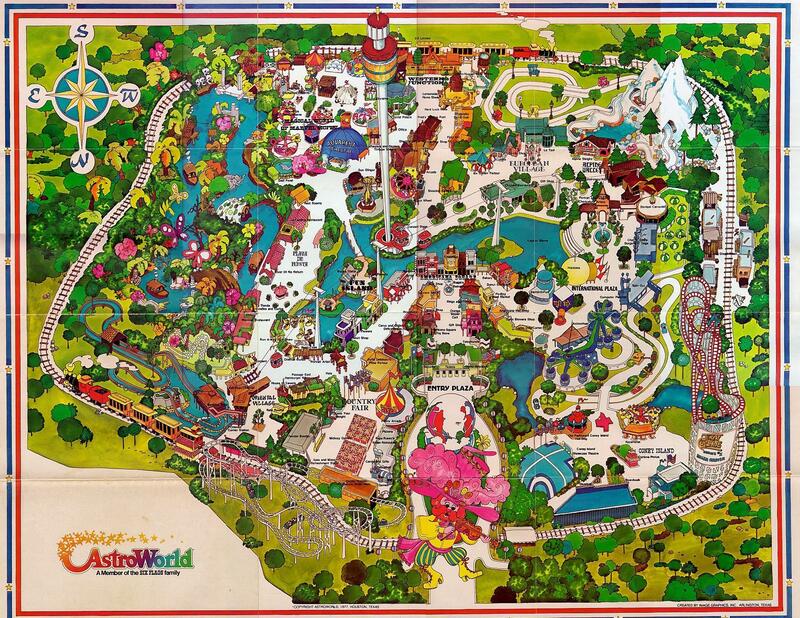 AstroWorld was a theme park that began its existence in the late 60s and was the brainchild of a former mayor of Houston, Judge Roy Hofheinz. It was located across the 610 freeway from the Astrodome. 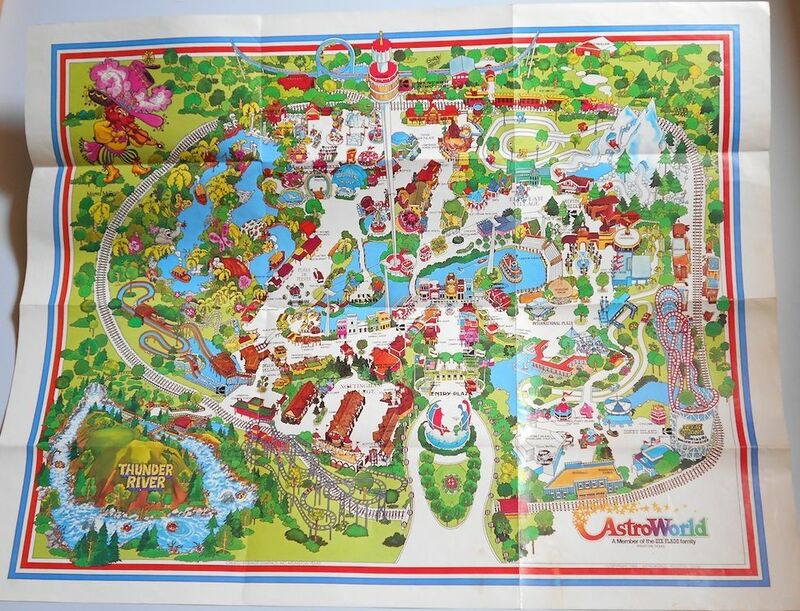 AstroWorld opened its doors on June 1, 1968 and operated seasonally each year until October 30, 2005 when it ceased operations. When the park opened in 1968, it featured a unique sled ride called the Alpine Sleighs that wound its way through a constructed mountain. The Alpine Sleighs were located in the Alpine Valley section of the park and had the same thrill value of a roller coaster. A “sleigh” consisted of an electric powered 4 person cars with rubber tires. A steel roller coaster, called The Serpent, located in the Oriental Village section of the park opened in 1969. Even though The Serpent started out as an adult coaster, because of its relative size and tameness, it would eventually be classified as a children’s ride once Dexter Frebish’s Electric Roller Ride opened in 1972. 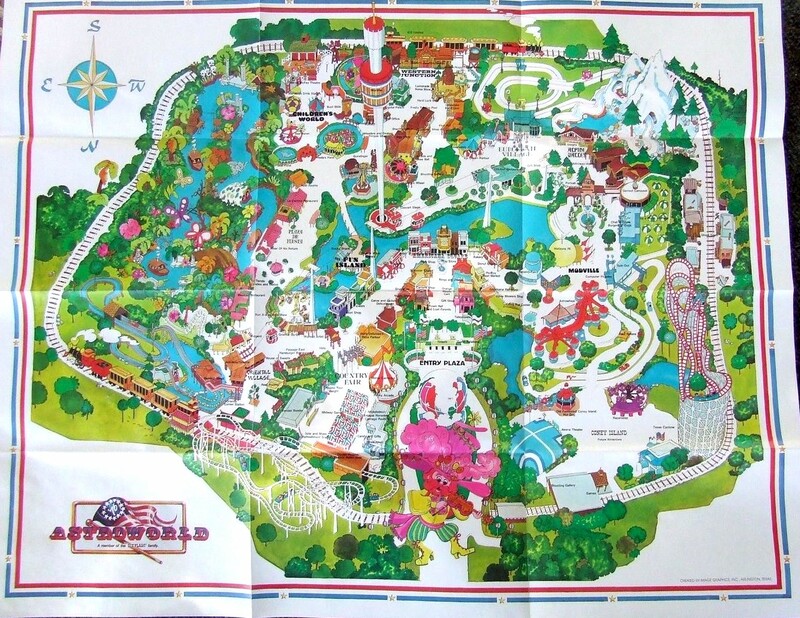 In 1975, the park was sold to Six Flags corporation. 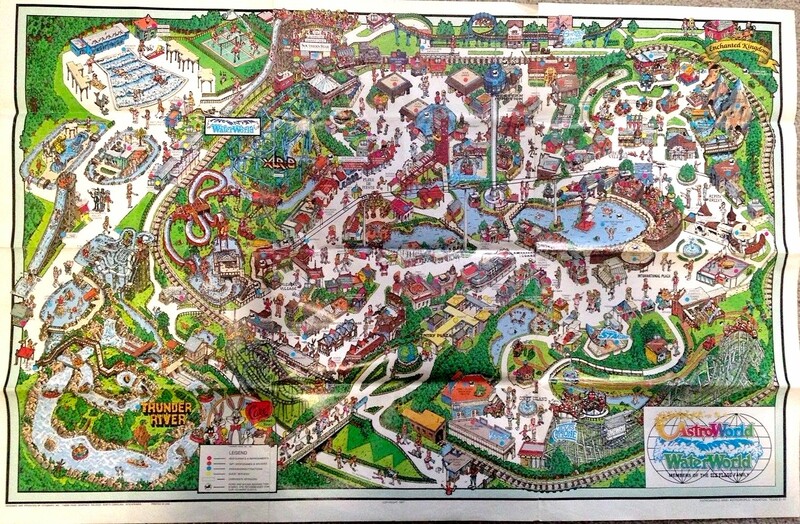 From 1975 to 2005, the park was owned and operated by Six Flags. 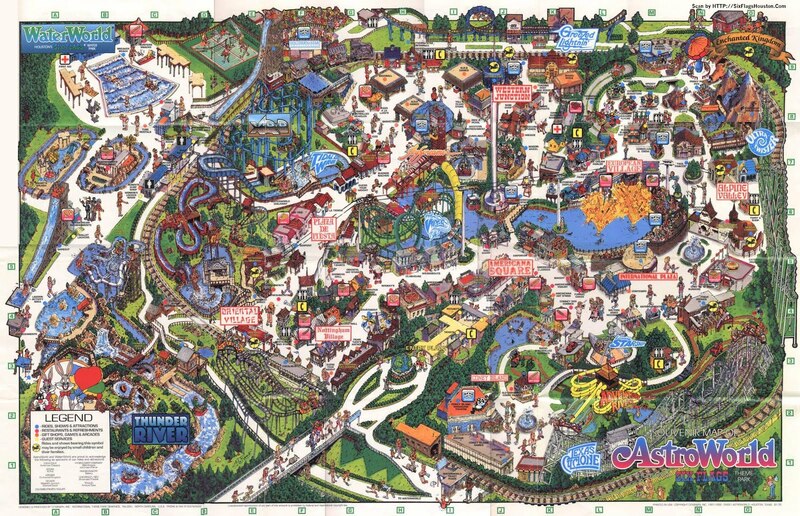 In that time, Six Flags grew the park with more and more thrill rides including many large and wild roller coasters. In 1976, The Texas Cyclone opened. This wooden roller coaster was located in the Coney Island section and was designed to mimic the feel of the original Cyclone located Coney Island in New York, but it did not mimic the track layout. It would be the only wooden coaster in the park. All other coasters built would be steel coasters. A number of rides cycled in and out of the park from 1968 through to its closure in 2005, but the sections pretty much remained intact with only the occasional rename. Not many were renamed or rethemed. 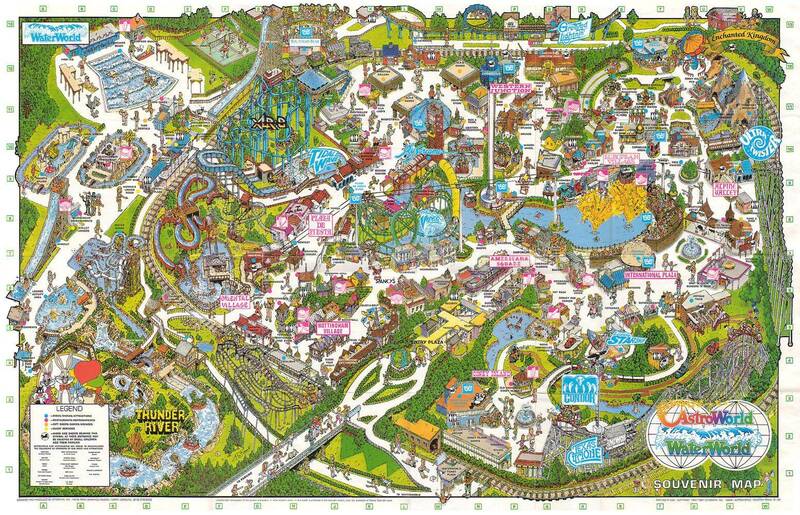 In fact, only one section would actually be rethemed in all of that time, Country Fair became Nottingham Village going from a midway carnival atmosphere to a renaissance fair look and feel including a Biergarten sporting Octoberfest style food all year round. In fact, with the introduction of Nottingham Village, they also introduced alcohol into the park through that same Biergarten. Unfortunately, Fun Island would be the only section that wouldn’t last beyond the 80s. In fact, that land would eventually become home to a roller coaster. 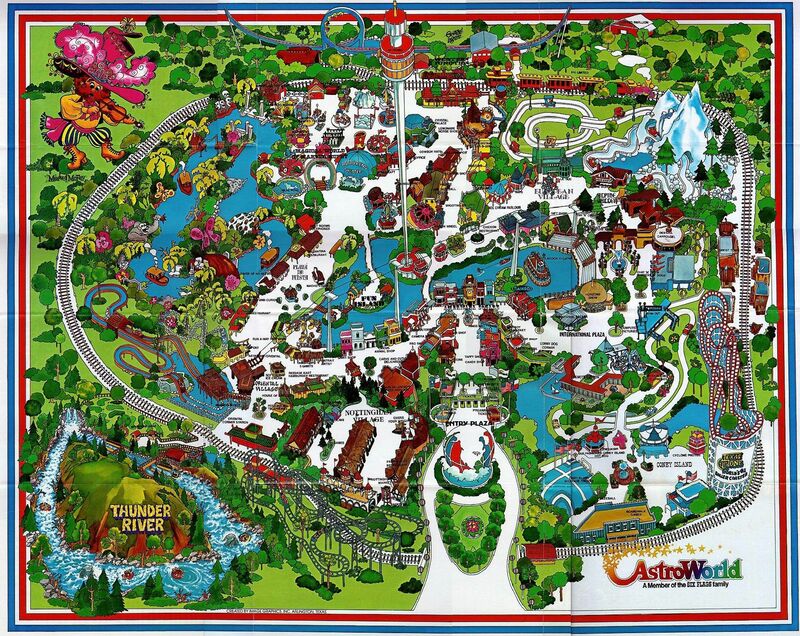 Also, the Children’s World section would be moved from its original location to a new location near the Alpine mountain after the Alpine Sleighs ride was retired. 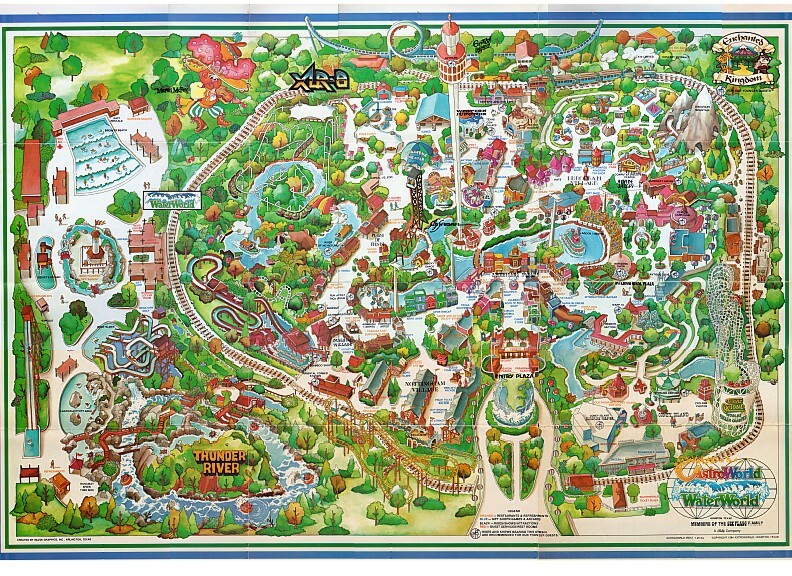 Children’s World was renamed Enchanted Kingdom, then later renamed again to Looney Toons Town. 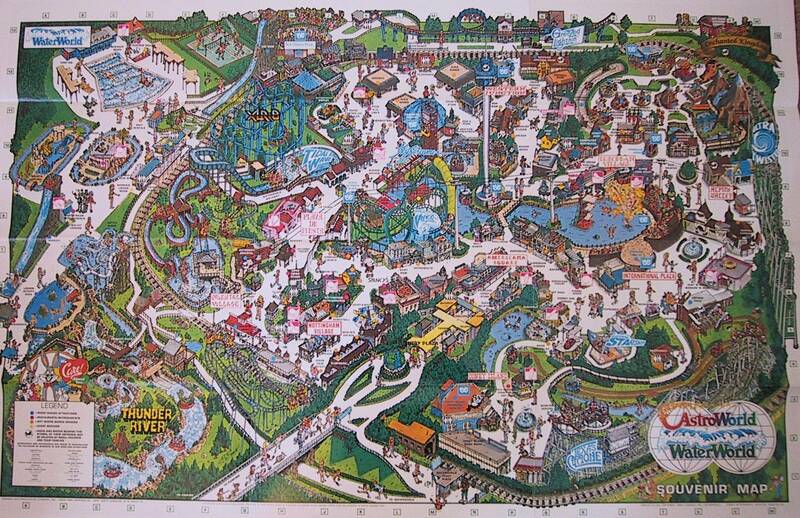 The Pioneer section housed only one ride, Thunder River. For this reason, it never got separate section marker on the map. As with any park, every year brought new changes, new additions and new removals. The park also underwent several logo changes. The first logo included 4 globe icons using two different typefaces. 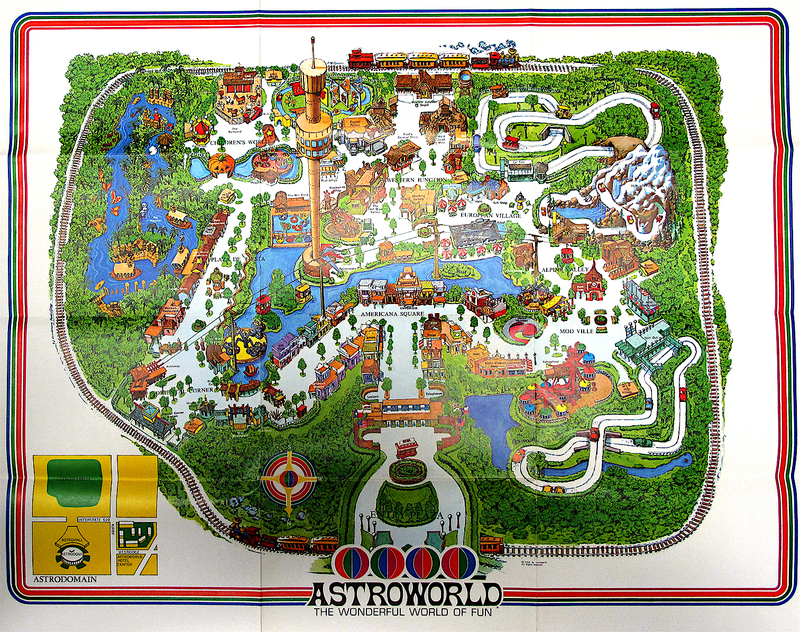 The next logo included the word AstroWorld stylized with stars above it (see below). This was my personal favorite logo. A modified version of the stars logo with the stars removed was used for a short period on maps. The final logo included a blocky italicized typeface and six small flags to obviously signify the park was owned by Six Flags. A special logo was used on only on the 1976 map to commemorate the Bicentennial. 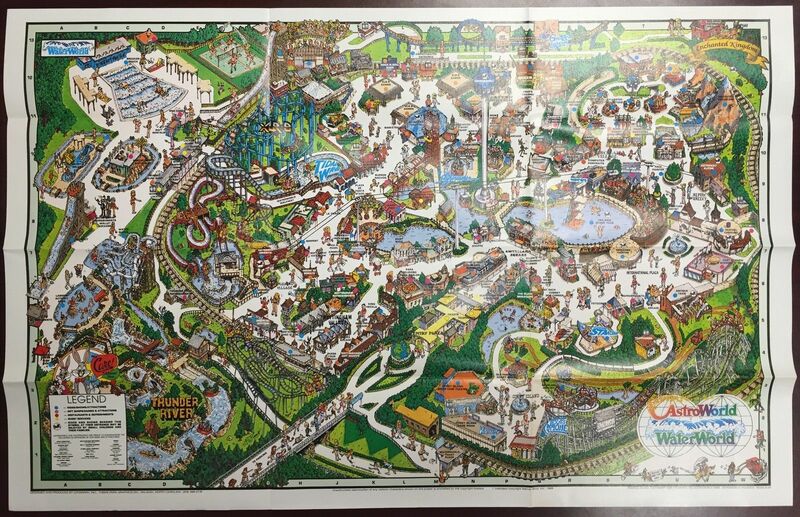 Here are various park maps from 1968 to 2004 for you to see how the park changed up until 2004. 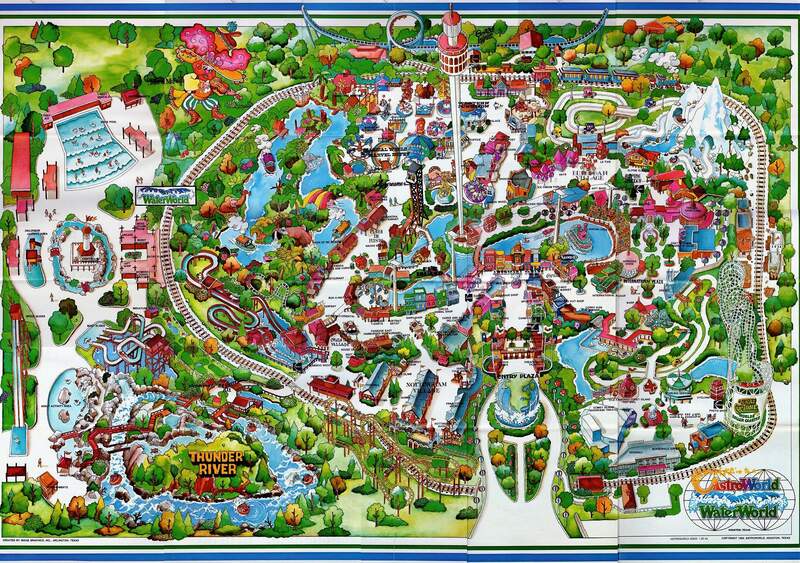 The 2004 image is actually an aerial view of the park from Google Earth. The park ultimately succumbed to a contract dispute between the Astrodome / Reliant Stadium parking lot owners and Six Flags. 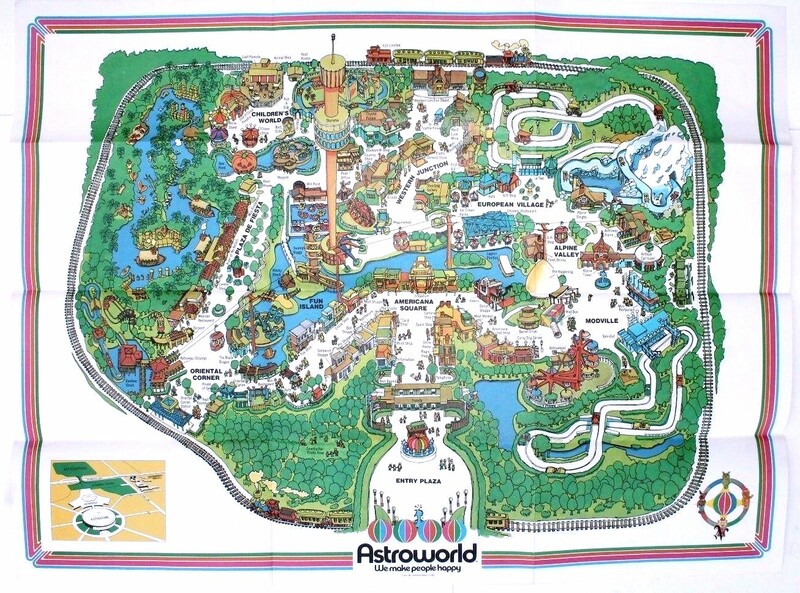 AstroWorld did not have its own parking lot. Instead, it leased parking from the Reliant land owners. 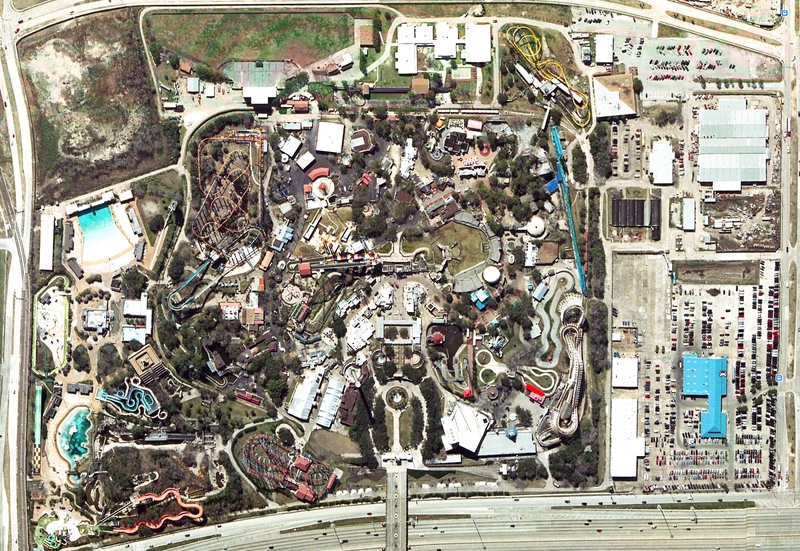 Because AstroWorld was dependent on that parking lot for its attendees, when the contract dispute erupted and ultimately broke down, Six Flags evaluated the situation and the current land values of the ~72 acres of AstroWorld property. Instead of renewing the parking lease, Six Flags decided to cease AstroWorld’s operations, dismantle the park and sell the land. After all of the dust settled, Six Flags had actually lost money on the deal because they couldn’t get the land prices they expected and demolishing the park cost a lot more than predicted. 120 full time employees lost their jobs and the 1200 seasonal workers hired each year would be lost. It was a sad demise to one of Six Flags’s better theme park properties. Today, that land still sits vacant and is only used as overflow parking for Reliant Stadium. The then Six Flags CEO, Kieran Burke, was ousted just two months after AstroWorld closed because of his cluster of an idea to close AstroWorld had backfired on Six Flags and failed. To set the tone of each of the sections above, the park had loud speakers throughout the park playing music. Some were hidden in shrubs or under fake rocks, others were horn speakers affixed to buildings. Over the years, the music changed and updated as the audio systems improved, but many tracks remained the same. During the 80s, the system used tapes. In the 90s and 00s, I’m sure the system was switched to first CDs, then computer based systems. In the updated systems, some new music was introduced into various sections. You might remember hearing a few of these tracks while wandering through the park. Note, you will need an Apple Music account to play the music, but you can see the track names and artists and play short samples even if you don’t have a subscription. The below playlists include music in use during the 80s, 90s and 00s. Note that I don’t have the playlists for the Country Fair, Modville or Fun Island sections. There was also Looney Toons Town section, but this music is not available on Apple Music that I have been able to find. There was also some incidental music used on rides such as the Dentzel Carousel and The River of No Return / River Adventure Ride that also don’t have playlists. There are also some additional Mexicana tracks which are not on Apple Music, but can be found in this playlist on SoundCloud. 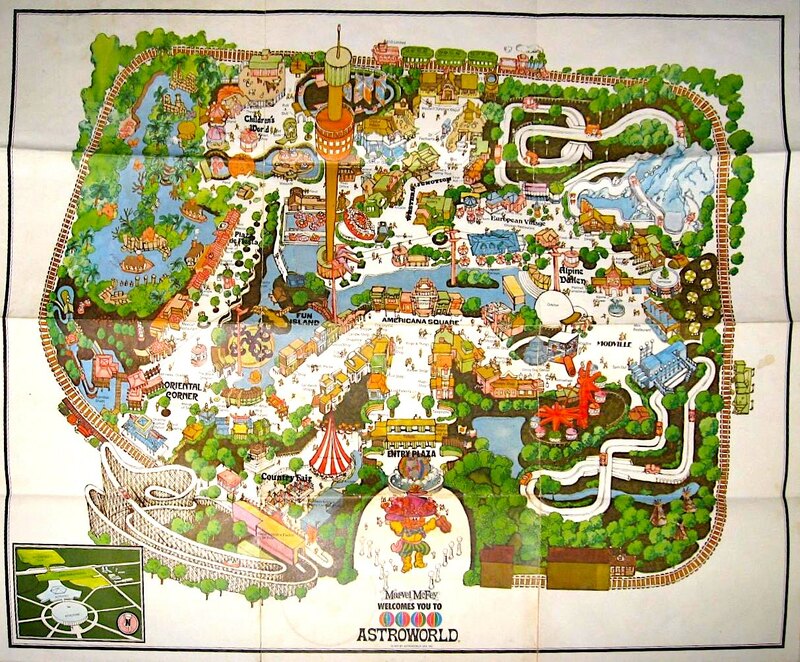 Without further adieu, let’s have a listen to the music that played every operating day at AstroWorld. As always, if you enjoy what you’ve just read on Randocity or heard on Apple Music, please like, subscribe and comment. 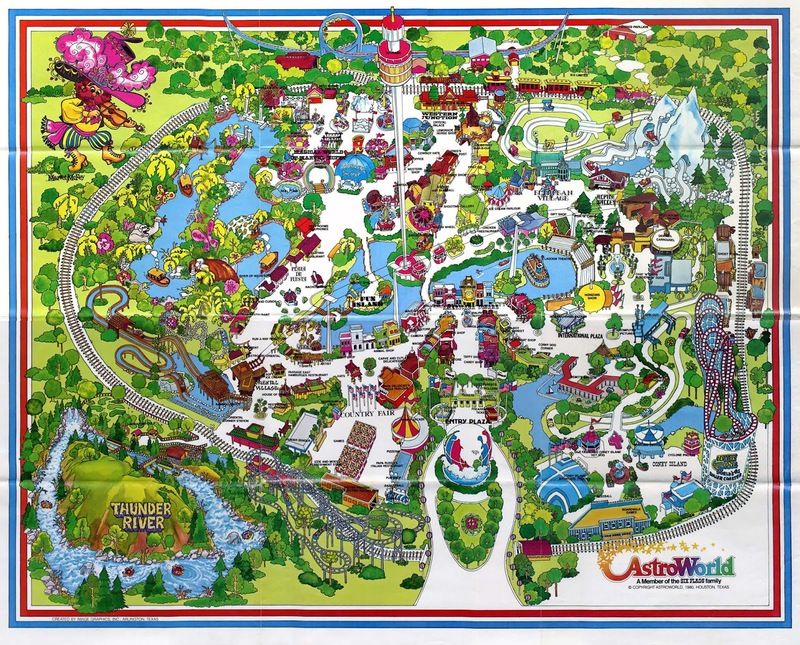 If you would like to read more about AstroWorld, please leave a comment below and I will consider writing a longer segment about this theme park.